The Dubai Zoo received a record number of 28,299 visitors during the Eid Al Adha holidays and the income also broke the previous years' records as the Zoo authorities collected Dhs56,598 through ticket sales during the five days of the holidays. Dr Reza Khan, Specialist at the Zoo Section of Dubai Municipality said that the figures show a marked increase compared to the previous years. "We had 5,788 more visitors than last year and the income also rose by Dhs11,576 this year. During 2009, we had collected Dhs45,022 through 22,511 visitors. These figures were 19,823 visitors and Dhs39,646 in 2008," he said. 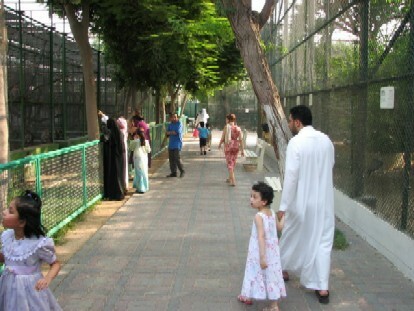 The record number of visitors thronged the Zoo on the third day of Eid (Thursday). On this day, 9,043 entered the Dubai Zoo. On the first day of the Eid (Tuesday), 2,293 visitors reached the Zoo and the second day it was 6,554 people. The fourth and fifth days of Eid holidays witnessed a crowd of 5,869 visitors and 4,540 visitors respectively.